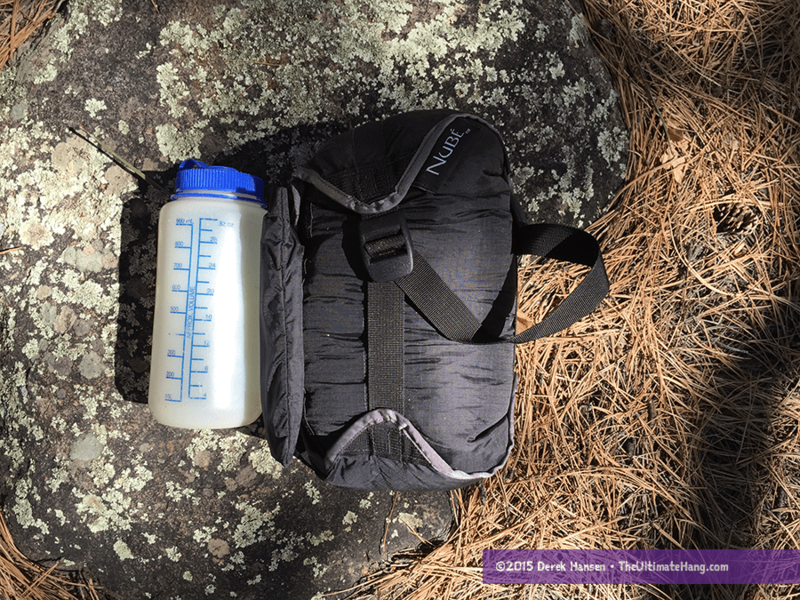 The team over at Sierra Madre Research, or SMr, have generated a lot of buzz around their new gear, particularly their integrated shelter, the Nubé (pronounced “New Bay”). Their products have been popular enough to keep them in short supply, and I was eager to see if the shelter lived up to all the hype. I am very grateful to the SMr team for sending me a complete set-up to test and review. I thought I’d start my review a little different this time by first talking about the SMr backstory. I felt this was important because a lot of companies today are adding corporate social responsibility (CSR) as part of their business practice. There are many reasons companies get involved with CSR, including appealing to a socially-conscious Millennial market, but not many build their business around social responsibility (KAMMOK is another brand that has done this). I was struck by SMr founder Richard Rhett Jr.’s experience and motives, but more by the outcome of his experience in Central America (his story is worth the read). Rhett wanted to make a real difference in the lives of the people he met, and the solution was two fold: build a gear company with a manufacturing plant (SMr ILLUMINATE) in Managua, Nicaragua to help train and directly benefit employees in a developing country (jobs, teaching, and training them in Western business culture) where opportunities and good working conditions are scarce; and donating portions of their profits to drilling wells for clean water in Central America (current wells are being drilled in Honduras). SMr has released two hammocks, but most of the excitement surrounds their unique shelter system, the Nubé. *This is an average width on one side since the wings point out unevenly. †I measured the true ridge line length—from Sky Hook to Sky Hook. The closure sleeves add some additional length, but it cannot be pulled straight out when deployed and only serves to cover the hammock ends. In the end, the Nubé provides adequate coverage for a hammock, it just does it in a unique way. Closure Sleeves, or beaks on each end of the Nubé that seal off the ends of the hammocks, similar to doors on a winter or 4-season tarp. Completely enclosed closure sleeves to ensure full storm seal and control. The Nubé label is on the zipper size for easy identification when you’re setting up. 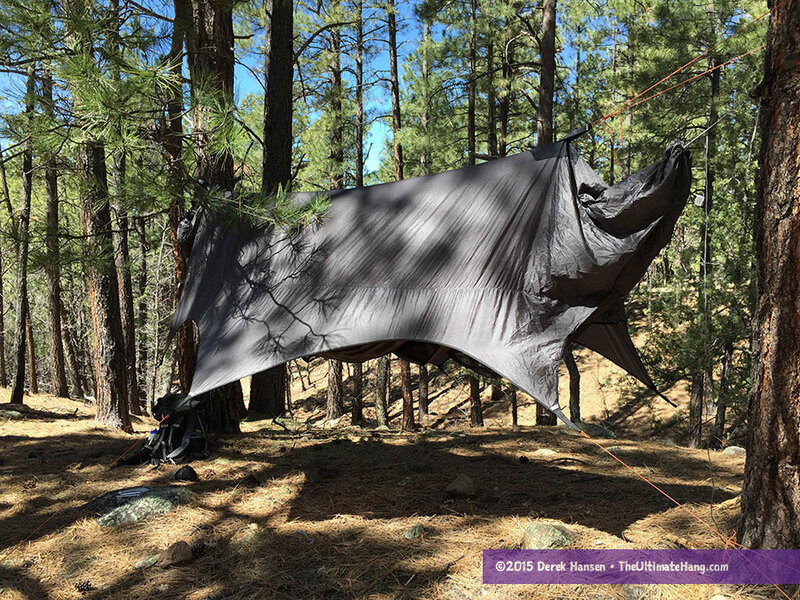 The tarp corners are designed to be anchored toward the tree or anchor of the ridge line, which helps with the aerodynamic design of the Nubé and storm control. The deep catenary cut sides are designed for easier entry and exit, but also to provide better viewing when inside. The Nubé was designed with two styles of pitch modes: high and low. 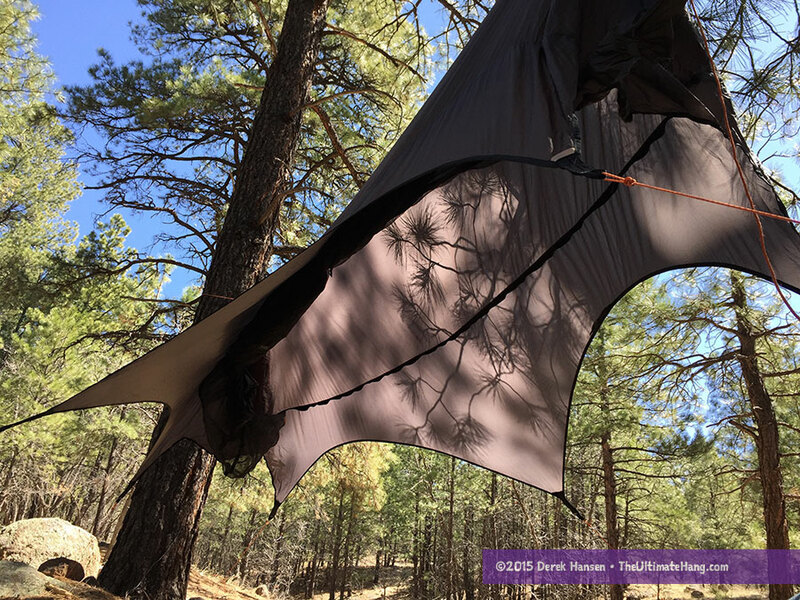 High-mode keeps the bug net and gear loft off the ground and provides maximum head room (based on how high you can reach to hang the ridge line) and keeps the gear hammock floating off the ground. Low-mode allows the gear hammock to touch the ground, which is more in line with a tent-style. Since the gear loft is made from a tough, water resistant 70d ripstop, it is made to act as a “floor” that you can on. Just be careful not to put too much stress on the bug net during egress and ingress. The Nubé shelter, briefly described, is a tarp with an integrated bug net, similar in some respects to the Hammock Bliss Sky Tent and even the NEMO Bugout shelters. But the differences end there. SMr didn’t just take a hex or winter tarp and add a bug net—the entire structure has been thoughtfully designed to combat lingering issues with open tarps, such as gear storage, water seeping down the hammock suspension, sideways precipitation, and seam leaks. The ends of the Nubé (where other tarps have “doors”) are completely sealed shut and include “Closure Sleeves” which are flexible tubes of fabric that extend over the hammock ends and suspension, cinch up, effectively cutting out all moisture—a built-in water break. Another unique feature of the Nubé is the integrated gear hammock that is sewn onto the bottom of the bug netting. This “Gear Stash”—a 70d ripstop nylon “mini hammock” with a 1,200 mm PU coating—can hold up to 200 lbs (91 kg) when secured to the hammock suspension (the Gear Stash includes its own suspension lines). I should make a note here that the shelter itself is not designed to bear any weight—hammocks and gear loft must be secured to a secondary suspension system, not to the shelter. The shelter has very aggressive catenary-cut edges with six guy points. 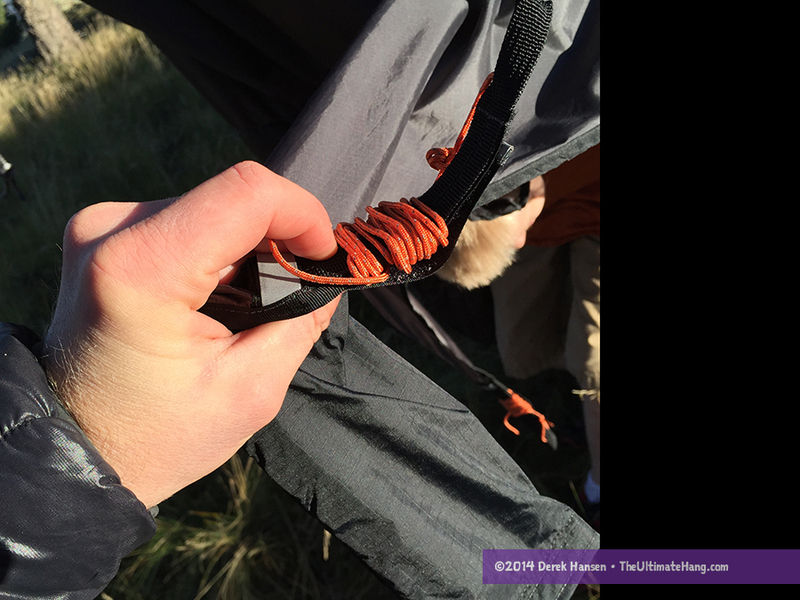 The guy line, including the ridge line “Sky Hooks” use hook-and-loop keepers to store the wrapped line for storage. Like the NEMO Bugout shelters, the Nubé’s bug net can be rolled up, and clipped out of the way when not needed. The Nubé’s netting has a zipper only on one side, so it is helpful to mark the ends so you can easily orient the shelter when you are pitching it. The Nubé is designed for a single occupant but can be used with two stacked hammocks when necessary. The Nubé compared with the two SMr hammocks. Notice the length comparison. The xPlor hammock acts as a sort of hammock ridge line for the Pares. The tarp and shelter are modest in size, about the same proportions and dimensions as your typical hex or winter tarp. However, the interior space is a lot roomier than a hammock with an integrated, zippered bug net. The Nubé is designed with a seamless ridge line. The main seams (which are taped) are where the bug netting is sewn, which is lower down on the side of the tarp. 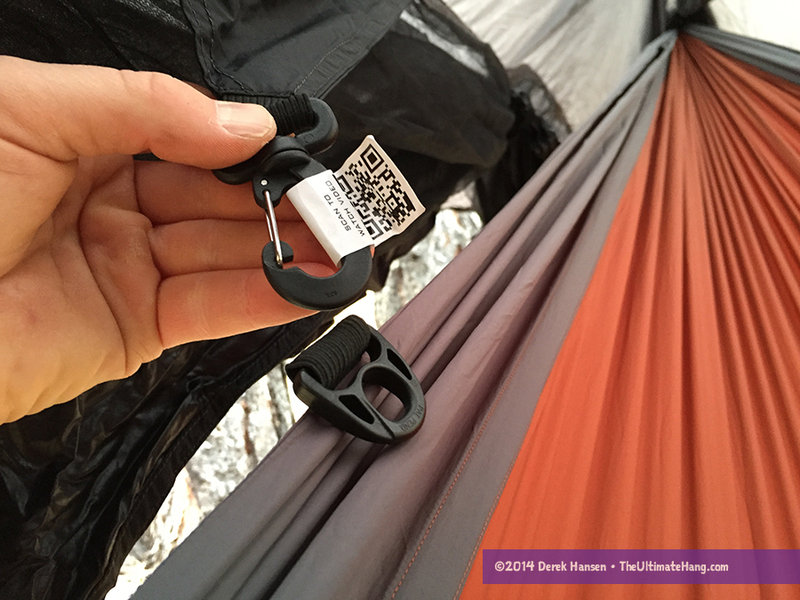 Clips on the inside of the bug netting match to the Pares hammock that help hold it open, making entering the hammock a little easier, but also keeping the material from flopping in your face while laying down. DuroSack is the name for the Nubé’s tough, 4-way compression, double-sided stuff sack. There is also a hook-and-loop patch on the side where the stake bag can attach. The gear hammock uses waterproof fabric, which introduces some tradeoffs in performance and usability. 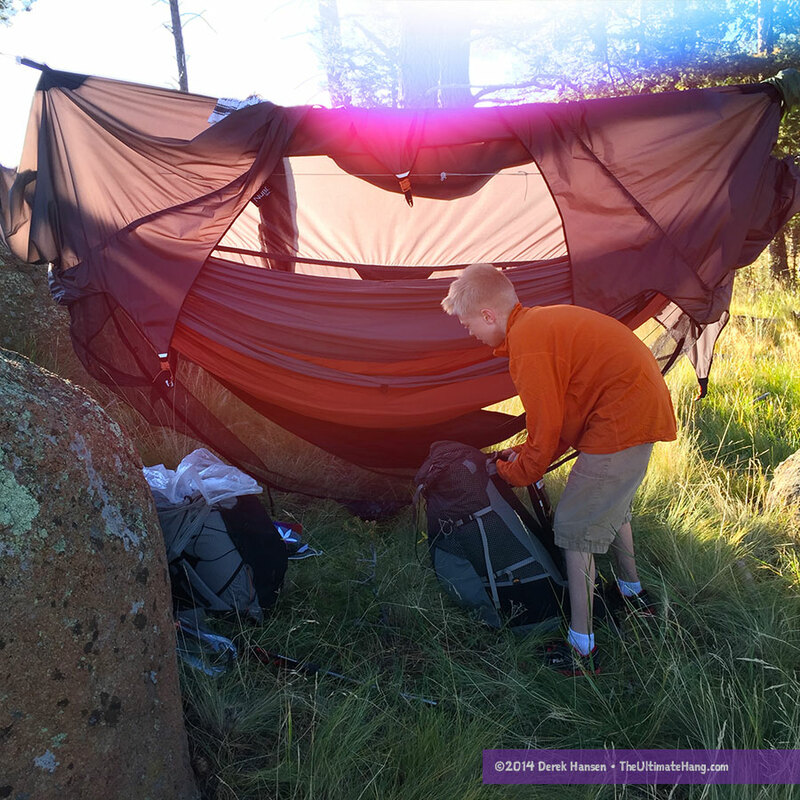 For example, on a backpacking trek with my son, we set up the shelter with a less than optimal hang distance so my under quilt was in direct contact with the gear hammock. In the morning, I noticed a fair amount of condensation on both my under quilt and the gear hammock. 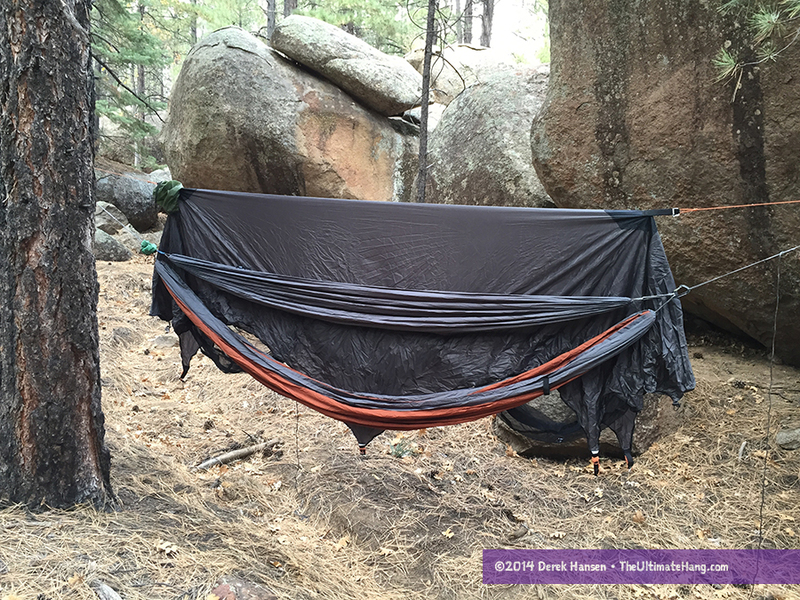 On the flip side, since the mini hammock is waterproof, it offers a degree of splash protection and abrasion protection for the bug net and gear. On other full-length bug nets, I’ve worn holes through the netting after prolonged exposure with the ground. The Nubé helps protect against that, you just need to be careful about condensation issues. The Nubé, in a “deflated” state as we pack-up from a backpacking trip transversing Mount Elden. The cord lock toggles used to hold up the netting when not in use are a nice feature. You can also wrap up a hammock at the same time, providing a roomy vestibule area. I also like the pull outs for the guy line. These have been designed with a hook-and-loop fastener to keep the guy line wrapped and secured during storage. For those who have my book, you’ll know that I’m a fan of QR codes. SMr has placed stickers with QR codes on every key feature of the shelter. These QR codes jump to short video segments on how to use each feature. I’m also a fan of double-sided stuff sacks, but all the extra buckles, straps, and heavier material make this sack a little too heavy for my taste. The EZSlings suspension. Pictured above is a retrofitted Whoopie Sling. Below is the stock version with the knots. I really liked the EZSlings—SMr’s strap anchor and suspension combination at 6.7 oz (190 g) for the pair. The tubular webbing is slightly narrow at 3/4 in (19 mm) and I’d prefer a full inch (2.5 cm) to offer more protection for more types of tree bark. The knots running down the Amsteel is a simple way to provide for multiple connection points, while trying to be both light weight and strong. While the suspension system is usable as designed, I did reverse engineer the suspension and converted them into Whoopie Slings as a test. 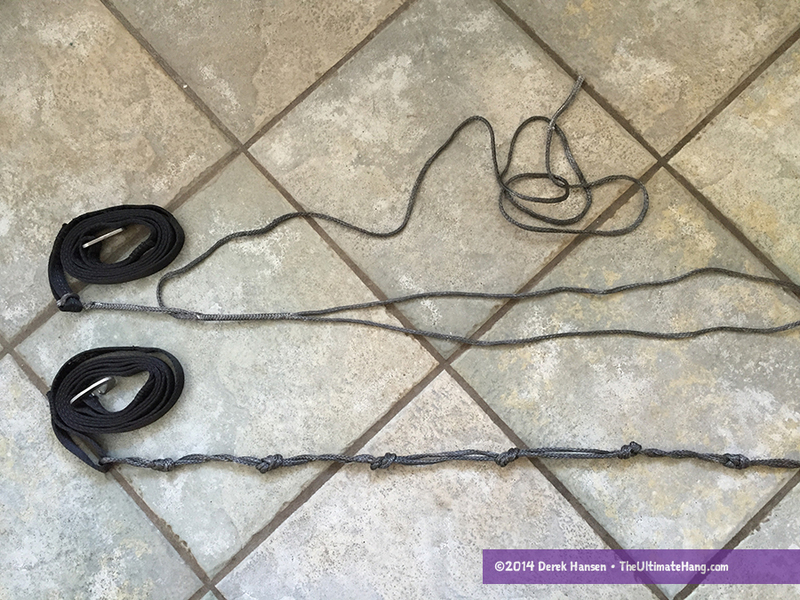 For those who want the DIY challenge, this hack provided three times the adjustable length with the same amount of cordage. I also added DutchWare Ti Clips for quicker strap connection around the tree. 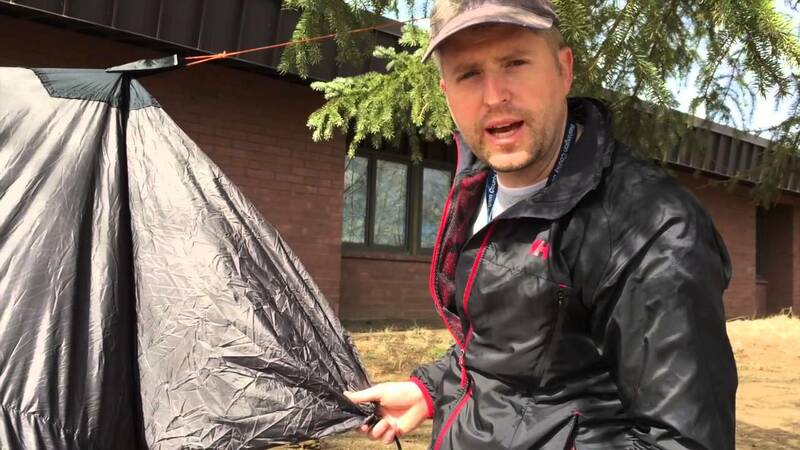 The built-in “storm mode” limits the ways you can pitch the tarp, such as in a porch mode, with one side open. This is one of the tradeoffs with the Nubé: full, built-in storm protection vs. modular pitch options. The cat-cut sides or wings can be pulled at to some degree, but within the limits imposed by the enclosed beaks. My only real negative with the Nubé is the lack of an easy entrance into the shelter. The tarp is constructed much like a tent, with a predefined shape and structure, but it lacks doors, so the only way in is to duck under the side. One solution is to pitch the tarp high, ensuring you still have enough access for the hammock. Did you do any testing to see if the sleeves really prevented any water from running down the suspension? I’ll shoot a video to show how well they work. I’ve really liked the look and concept of the Nube. The company scores high points for their charitable model. I’m a weight weenie so I’d be concerned about the 3 plus lbs of it. At the same time it is nice that it accommodates two hammocks. I’d love to try one out someday and bite the bullet on the cost. Does the winter barrier eliminate the need for an under quilt or is it just some added insulation, if you will? The winter barrier is not insulation. It is similar to an under cover. It seals off the shelter from wind and helps create dead air that helps trap heat better. Weather covers add about 10 to 15 degrees of warmth. You’ll still need insulation. Any recommendations on over and under quilts that would work well with the Pares? Any quilt set will work. They are very basic hammocks like most on the market. The fabric, handles, and Nubé clips are differentiators. Used the Nube / Winter barrier plus Pares on UK trek this March, perfect! Good 3 season sleeping bag no additional insulation needed. Outside temp at night about 3oC. Looked great, very functional. Agree with Derek that getting in / out without placing stress on Nube was on my mind. Hi ! First of all, Thanks for ur work. The Nubé is perfect for the rain and it will be able to hold your packs. The interior space will be tight for two adults. Bunking hammocks works but it won’t be as cozy, especially with two big packs in the storage. It might work with an accessory item, the Dutch ware double whoopie hooks and spreader bars. This would allow you to hang side by side in two separate hammocks instead of bunked. Thk u very much. Is the weight in the storage can reduce the interior space of the Nubé? We use to sleep both of us in a XL hammock, so we take the same size as a single person. Also, I would know what the mesh size of the bug net (Is it able to protect against sandflies = 1 millimeters max). And last questions, is it possible to set the Dutch ware double whoopie hooks with the spreader bars to hang the Two person Clark Vertex hammock with just two trees ? And the vertex is it a two layers (to put something for isolating moisture)? If you and your partner can and want to sleep in the same hammock, your problems are solved and the Nubé is a good fit. You’ll want a big hammock. Like the Kammok Roo or Hammock Bliss Triple. Yes, the netting is fine enough. I don’t think the whoopie hook and spreader bar is quite the perfect length but it is possible. The center storage area may not be as usable.